General Mary Christmas (max 1) Travels twice as quickly to adventures. Commands up to 200 units. Versed Geologist (max 1) Finds 50% bigger deposits, 50% faster and has a 50% chance of finding an additional deposit. Recipe: Grille Steak (max 1) A recipe to unlocks Freddy’s famous grilled steak. Recipe: Smelter Calendar (max 1) Increases the production of smelters (Bronze, Iron, Steel, Gold, Titanium, Platinum), Epic Smelters (Bronze, Iron, Steel, Damascene, Platinum) about 2x for 8 hours. Recipe: Forest Offerings (max 1) Doubles the production output of up to four woodcutters, foresters, sawmills and tree nurseries in a small area for 12 hours. Recipe: Kitty Lure (max 1) Doubles the production output of up to four farms, improved farms, silos, improved silos and mills in a small area for 24 hours. Efficient Traps 07:30 minutes 300 + 150 + 50 7 Increases the production of building hunter and deerstalker hut about 2x in 12 hours a radius of 4 squares. Platinum Horseshoes 02:30 minutes 1.200 + 400 54 Adds 20% movement speed to all generals on an adventure. Smelter Calendar 07:30 minutes 300 + 150 + 31 7 Increases the production of smelters (Bronze, Iron, Steel, Gold, Titanium, Platinum), Epic Smelters (Bronze, Iron, Steel, Damascene, Platinum) about 2x for 8 hours. Description: The window that can open almost every day during the event. Rewards: Opening the window provides random prizes. Description: A window that can be opened only if all previous windows were open. 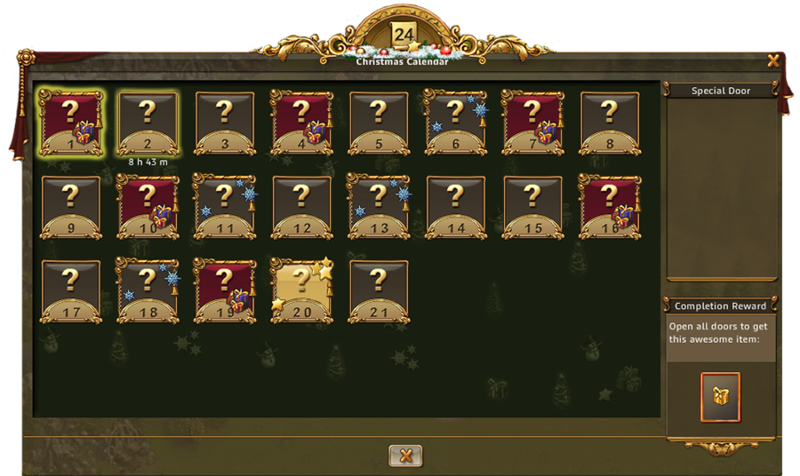 Reward: The player can pick a prize from the list on the right – after his selection can not be changed! Reward: Opening the window provides Christmas adventure. 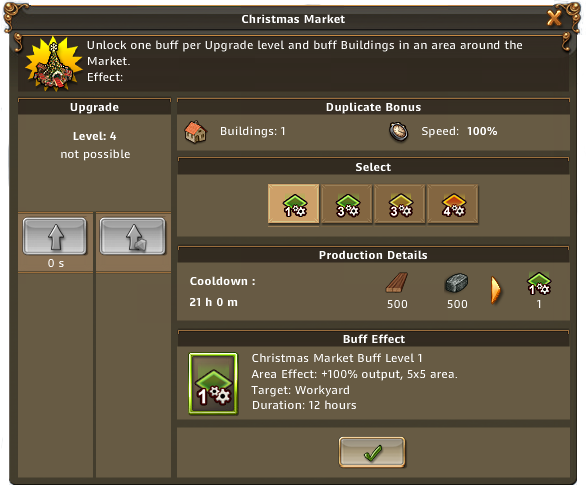 Description: 28th window can only be opened 28 day of the event, if all previous windows were open. Reward: The player can pick a prize from the list on the right – after his selection can not be change it!